My name’s Randi Dukoff, and I’m a certified in functional diagnostic nutrition, metabolic typing, as a holistic life coach and exercise coach with the C.H.E.K Institute and a health coach. I’ll be guiding you through this 14-day Grain-Free transformation. This was me in 2000 and me now in 2017. I understand first hand what an inflamed body feels like. I changed my lifestyle habits to work for me. Every person needs a slightly different diet and trying a grain free diet for 14-days will begin to reduce your inflammation, increase your focus and make you feel better quickly. With this, you’ll learn how to ditch the foods that inflame your organs and take advantage of all the primal foods that will boost your health and vitality and turn your body into a lean fat-burning machine. You’ll ditch the carbs, sugar, and dairy and GET the food that really works for your body, not against. Clean eating isn’t a fad or a diet; this is a healthy way of life. Grain-Free in a nutshell is clean eating. 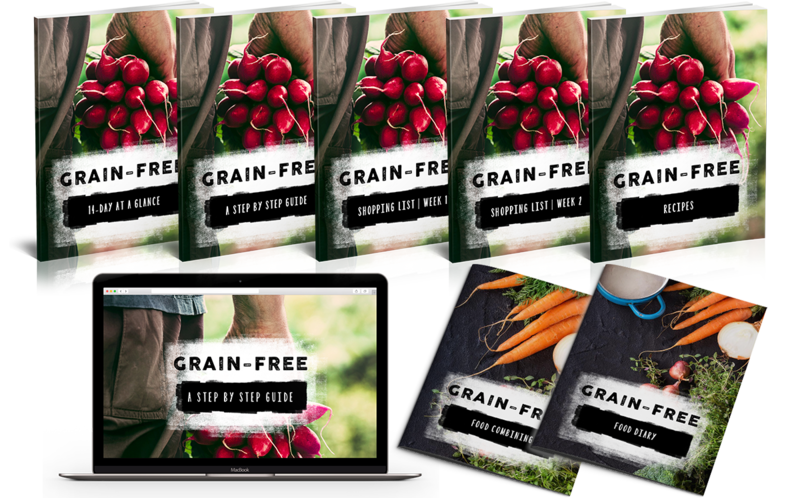 The Grain-Free diet is based on eating fruit, vegetables, seeds, nuts and clean protein sources such as eggs, chicken, beef, fish, seafood and lots of wonderful fats. There are no pills or crazy powders with this way of life, except for wholesome protein powders like hemp, pea and collagen powders.